Last week I touched on a vintage-themed keyboard that had all the bells and whistles of modern technology. Even though the Qwertywriter has the aesthetics of an old typewriter, it is made out of materials that are easier to mass produce. It is beautiful, and would make any office setting that much more appealing to be in, but it doesn’t really classify as a work of art. While I merely brushed over his work the late Richard Nagy, best known as “Datamancer”, made keyboards, displays, and laptops which gained world renown. He is succeed by a close friend who learned how to make his creations. While his hands are no longer directly involved in the process, his friends carry on his work. 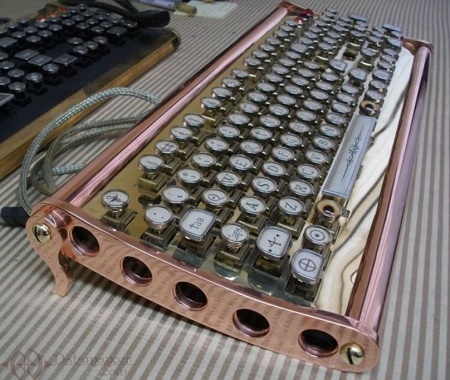 This is fine craftsmanship in a place you wouldn’t expect it, as each piece of these keyboards are made primarily of real metal and wooden parts. The keyboards are fitted with mechanical (cherry) keys, so you will get to hear that scrumptious clickity-clack with each press. It will sit a bit higher than a regular keyboard, so for those that are on their keyboards all day long, you’ll want to adjust to get proper support. Every keyboard has a general design, but is about as customizable as you can get. You can choose the language for the layout, a framed spacebar, a brass or aluminum body, the typeface, cable material, side panels, and LED jewel colors. Needless to say, this is not simply buying a keyboard, this is paying for an art commission. The “cheapest” keyboard they have starts at around $500, and can easily rocket up over a thousand. This has an attention to detail and functionality that certainly demands respect, but it will bite a considerable chunk out of your wallet.